The state’s once plentiful coastal salt marsh habitat has been heavily reduced by filling for development – this section of the Watershed Counts report cites that more than 50 percent of the valuable habitat has been lost over the last 200 years – and now sea level rise threatens what remains. Salt marshes act as a natural buffer to storms, providing protection for shoreline communities. They improve water quality, provide valuable wildlife habitat, and absorb and store carbon, among other functions. Sea levels in Rhode Island have been rising, and at an accelerated rate over the last 30 years. Observations in many of Rhode Island’s salt marshes confirm what models tell us: our salt marshes are beginning to drown in place, converting to mud flats or open water. And considering the latest sea level rise projections for 2100 from the National Oceanic and Atmospheric Administration (NOAA) of 9-11 feet, our vulnerable marshes need our help. Watershed Counts is a collaborative initiative of 60 partners facilitated by the University of Rhode Island Coastal Institute and the Narragansett Bay Estuary Program, the goal of which is to evaluate the conditions and trends of the land and waters of the Narragansett Bay and its watershed. 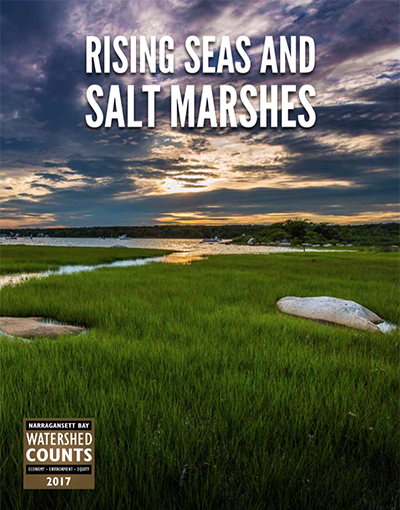 This segment of the 2017 report illustrates the growing crisis in the state of salt marsh loss from inundation or drowning, erosion and sea level rise. It is an issue the CRMC seeks to address through projects like the recently-completed Ninigret Pond salt marsh restoration and elevation enhancement project in Charlestown. Similar projects were also completed at Sachuest Point National Wildlife Refuge in Middletown and the John H. Chafee National Wildlife Refuge on Narrow River, where the CRMC served in an advisory capacity. “We know that in Rhode Island, our marshes are under considerable stress from accelerated sea level rise, so we are looking for ways to improve their resilience,” said Caitlin Chaffee, CRMC coastal policy analyst. Without intervention, our marshes cannot keep pace with rising sea levels, as shown by the Sea Level Affecting Marshes Model (SLAMM), a mapping and planning tool used by the CRMC to model RI coastal wetlands. The CRMC SLAMM project is now a planning component in the arsenal of the Shoreline Change SAMP. According to SLAMM project maps, Rhode Island is poised to lose 13 percent of its marshes with one foot of sea level rise; 52 percent of marshes with three feet of sea level rise; and a staggering 87 percent of its marshes with five feet of sea level rise. The RI SLAMM maps are being used to investigate areas where coastal marshes are likely to migrate inland and identify undeveloped tracts of land for unimpeded marsh migration. Regardless, the state will likely still experience a net loss of coastal wetlands in the future due to sea level rise and other factors.